Sometimes when we optimize our system, we may want to use only a subset of all parameter permutations for our analysis and ignore the others that do not meet our requirements. Then, shortPeriods parameter value should remain smaller than longPeriods, otherwise the trading rules would work against the main principle of the tested strategy. The information from Info tab of Analysis window shows the difference between first execution (all 10000 backtest runs) and second one using Exclude statement. Note reduced number of steps and reduced optimization time. If we want to identify dates, when MAE and MFE levels have been reached during the trade lifetime – we can use the code example presented below. The formula will process the trades one-by-one, read BarsInTrade property to know how many bars it took since trade entry till exit, then use HHVBars / LLVBars functions to identify how many bars have passed since lowest low or highest high within trade length. 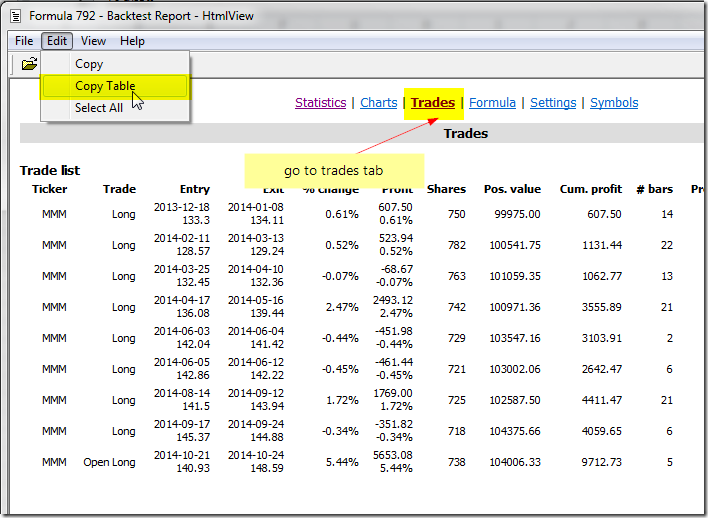 With the information that highest or lowest value was observed N-bars ago – it will shift Date/Time array accordingly – so with use of Lookup() function pointing at the exitbar – we can read the date when HHV/LLV was observed within trade lifetime (BarsInTrade). However, we are not limited to built-in metrics only. 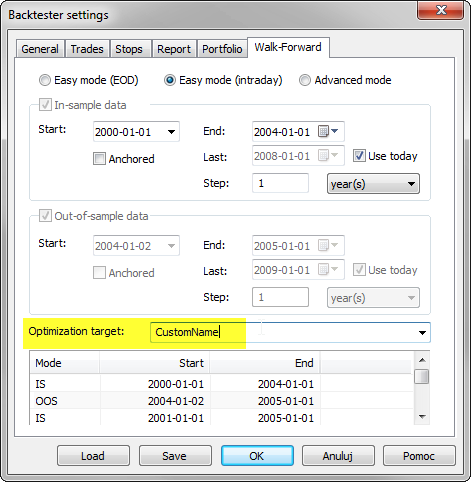 Custom Backtester Interface allows us to add any custom statistics to the backtest/optimization reports and we can use these metrics for optimization too. The name we enter must be an exact match of the metric name we have defined in AddCustomMetric() method. 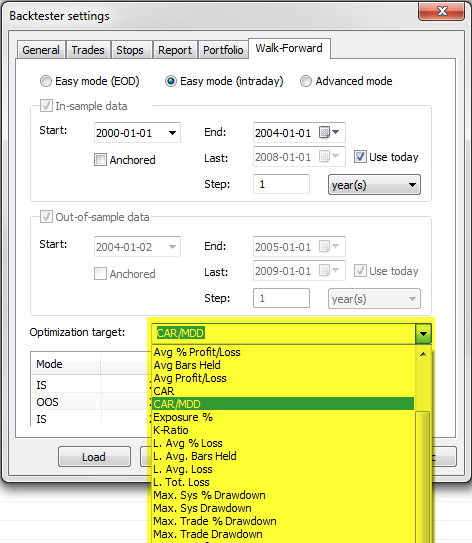 If entered name can not be found in the Optimization result table, then Net Profit will be used instead. The default backtest report shows total Net Profit figure, which includes both trading profits and interest earnings. With Custom Backtest procedure we can easily isolate these components by summing up profits and loses from individual trades, then subtracting trading gains from the Net Profit and report them as separate metrics. 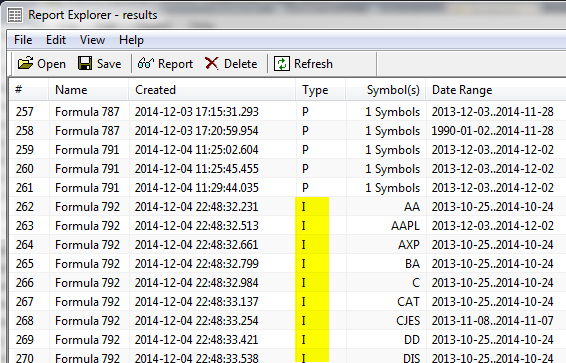 After backtest is run, we can see our custom metrics in the backtest report. 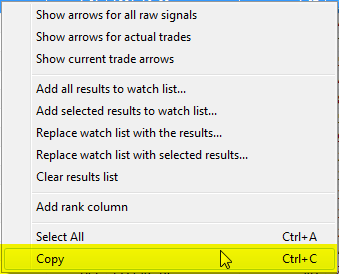 By default, when we run backtest over a group or watchlist of symbols – AmiBroker will perform a portfolio test. However, there is also an Individual mode of the backtest available, where every symbol is tested individually and independently. 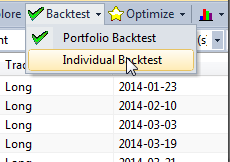 Once we send the formula to Analysis window and define group of symbols to run code on (Apply To), in order to run an individual backtest, it is necessary to unfold the menu next to Backtest button and choose Individual Backtest from the menu. To get full report generated for each of the tests, it is required to first go to Analysis–>Settings->Report tab and mark Generate detailed reports for each symbol in individual backtests option. Then the full reports can be accessed through the Report Explorer. The letter I indicates that the report contains results of an individual test. 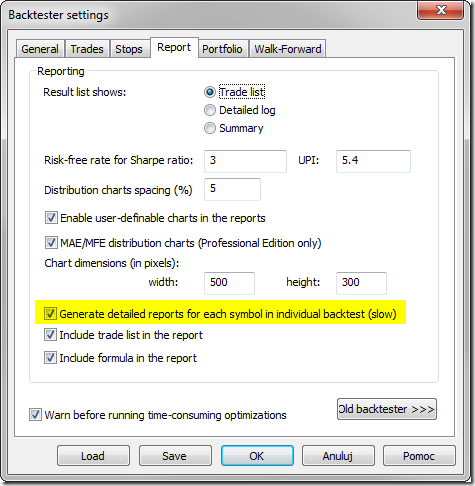 Double-clicking on the particular results line will show full contents of the backtest report. In order to synchronize data – the best is to copy the entire local database folder. Using just the same data source, especially if it is real-time feed may not be enough due to different array lengths or some corrections that may have been applied in historical data on data-vendors server in between. 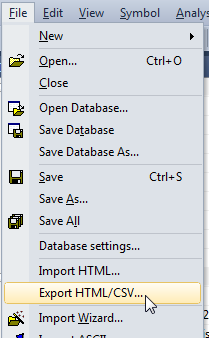 In case of any differences in results between two computers that is the very fist thing to check, as different input would result in different output. By running this code on both computers you can compare checksums to see if they are the same. If data, code and settings are identical, then the obtained results will also stay in sync. Why do backtest results change?